The Mercmaster™ LED Generation 3, a full-feature lighting solution, offers harsh industrial and hazardous industries a highly configurable luminaire designed to meet the most demanding task and area lighting requirements. 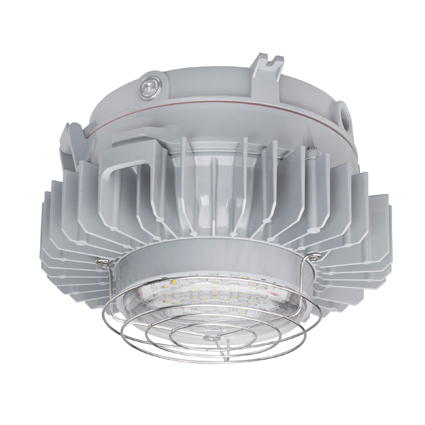 Featuring seven lumen outputs, six mounting types, four light distribution patterns, four replaceable globe choices, three color temperatures, two input voltages, and various retrofit adapter options, this best-in-class LED achieves unprecedented application versatility and comfort. Allowing Engineering, Procurement, and Construction firms (EPCs) to maximize spacing, while minimizing the number of fixtures required in a project, the Mercmaster™ LED Generation 3 delivers improved light distribution while reducing project costs. Secondary optics are used to direct light from the source to where it is needed. Unlike HID lamps, LEDs are highly directional, requiring specialized optics to reduce glare and provide even light distribution in a beam shape optimized for specific applications. Well designed optics can help designers achieve ideal spacing and minimize the number of luminaires required. Our new optics set the industry standard for comfortable, evenly distributed lighting, with a selection of patterns. Its rugged and corrosion-resistant design is rated for Class I, Division 2 and Class II hazardous locations, marine and wet locations, and is also certified for ATEX/IECEx Zone 2 and 21–22 to provide a globally rated lighting solution for all your harsh industrial and hazardous illumination needs. Our PlexPower fiber panels bring hybrid cables (power/fiber together in one cable) from up to 24 field junction boxes back to one enclosure located in the hazardous area, drastically reducing the number of long dedicated cable runs while also limiting potential failure points.